Sometimes, the intent of a speech is to persuade listeners to take action or change their views. In those cases, it is critical for the speech writer to use all his or her cleverness and ability. After all, if a speech is to move mountains, it must be undeniably powerful and thoroughly thought-provoking. Not surprisingly, persuasive speeches need a significant amount of “polishing” before they are given. For example, if a politician were to simply “wing” a talk asking for his or her constituents’ votes, it could cost him or her the election. Though your next persuasive speech may not involve high stakes, you should still give plenty of consideration into what you say and how you say it. Without a doubt, there are some public speaking masters who can seemingly pull persuasive speeches out of the air, but their ranks are few (and many of them simply give the illusion of improvisation.) For most speech makers, it is necessary to spend many hours perfecting the format of their discussions. Not all persuasive speeches need follow the same length, of course. Some may be short and to-the-point, focusing on only one issue. Others may be protracted, covering numerous subjects. 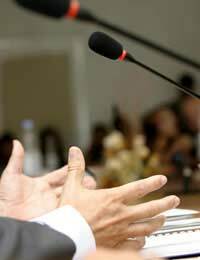 However, all persuasive speeches must contain an incredibly strong introduction as well as a memorable ending. Some common ways to start a persuasive speech include asking a rhetorical question (“Who will cry for the orphans of cancer’s cruel blows?”), boldly announcing a strong thought or position (“Poverty must come to an end, starting today, starting with me”), or creating an image in listeners’ minds (“When I graduated from university many years ago, I left these grounds with nothing but the clothes on my back, a volume of Shakespeare—the one book I didn’t sell for a few coins—, and a shining dream.”). By gaining control of the audience’s attention immediately (even if they don’t agree with what you have said), you have a much better chance of persuading them of your beliefs or suggestions. From this point, you can systematically highlight supporting views of your introductory statement or query in the body of your persuasive speech. What happened when Timothy tried to get off drugs after several years? How audience members can support you in remembrance of Timothy and others. (Take special note that each of these points answers a “who”, “what”, “when”, “where”, “how”, “why”, and/or “to what extent” question that is probably on your audience members’ minds.). The stage is now set for a strong conclusion, a tying together of everything that was discussed in the introduction and body of your persuasive speech. In the case of the hypothetical “Timothy” talk mentioned above, the final words spoken could be a reiteration of all the points and a call to action. Without such a direct request upon listeners to take it upon themselves to do or create something, a persuasive speech cannot achieve its full potential. The format of the persuasive speech is not unlike the typical “essay” setup that is taught in most secondary schools: An introduction is followed by three supporting paragraphs then ended with a conclusion that wraps it all up. There may be variations, but a general persuasive speech typically has a very specific structure that works well for even unseasoned speech makers who are expected to speak like pros.